There are so many different fabrics in this quanket, I wouldn’t know where to start to list which ones are “pieces of the past” – heck, I guess they’re all technically “pieces of the past” since they’re all from past projects! I plan to link this to the weekly linky party over at Quilting is more fun than Housework. Pop over to see all the other great scappy projects others have been working on. This was donated to the County of Ventura, Children & Family Services in March 2019, for a foster child. What do you do when the scraps get out of control? Make a quilt of course! In the process of putting away my latest project’s scraps, I found I could no longer squeeze scraps into my blues bin. It was like packing a really full suitcase, but even if I had sat on it, I was just not going to be able to cram even one more teeny weeny scrap in it. So I dumped the scraps onto my cutting table and started by cutting 2.5″ x 3.5″ rectangles from every piece of fabric that was big enough, ending up with close to 500 rectangles. My original plan was to just join them randomly: since there were so many different fabrics, this would work well. As I began organizing and grouping them by their color values, the idea of doing this scrappy quilt as a twist and turn Bargello came to me – an idea that had been tickling at the back of my brain for awhile. A couple years ago, I had made my first Bargello quilt based off a pattern I had from a 1993 issue of a Quilters Newsletter magazine. During the process of making it, I Google searched Bargello quilts and was awed by the twist and turn Bargello quilt designs. At that time, I was ready to move onto something different, but the idea of doing a twist and turn Bargello quilt at some future time seemed appealing. I sometimes like to use obscure names for my quilts: sometimes they are something personally meaningful to me, but sometimes, I just like quirky. I typically don’t divulge the deeper meaning, but I think even a Google search on this one would be challenging to find what 3273 K is. This is 3273 Kelvin, the temperature at which a flame burns blue, creating a pinpoint blue flame (also one of my favorite David Grey songs). This was donated in March 2019 to the County of Ventura, Children & Family Services, for a foster child. 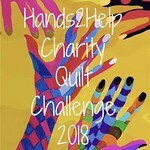 Back in September, Kate over at TallTalesfromChiconia was looking for contributors to her upcoming Ovarian Cancer Australia auction quilt. While I have not participated in a single-block donation project before, the timing of her request came at a significant time for me: a close family member had just been diagnosed with ovarian cancer, and I wanted to participate as a tribute to her and her battle. Kate’s plan was that every block feature some sort of mountain idea, and that the color palette be the Ovarian Cancer colors of teal and cream. As an avid backpacker, I have hiked many miles, mostly in California’s Sierra Nevada. The image of mountains in either the early morning or late evening is breath-taking. I love how the foreground hills have deeper color and the farther, distant mountains are taller, more rugged and their color is more muted, almost blending away into the sky. This is what I wanted my block (shown above) to mimic: how a mountain range looks in the fading light of day. As with all my quilt projects, I used fabric that was a piece from the past. In this block, the fabric used at the bottom was from my Granny. 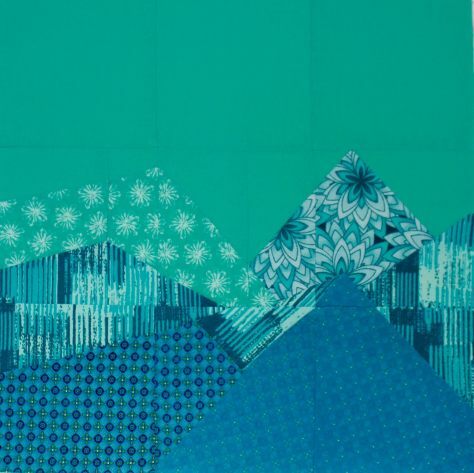 To help achieve differentiation between these two mountains, I used the front side of the fabric for the mountain on the left, and the back of the same fabric for the one to the right. 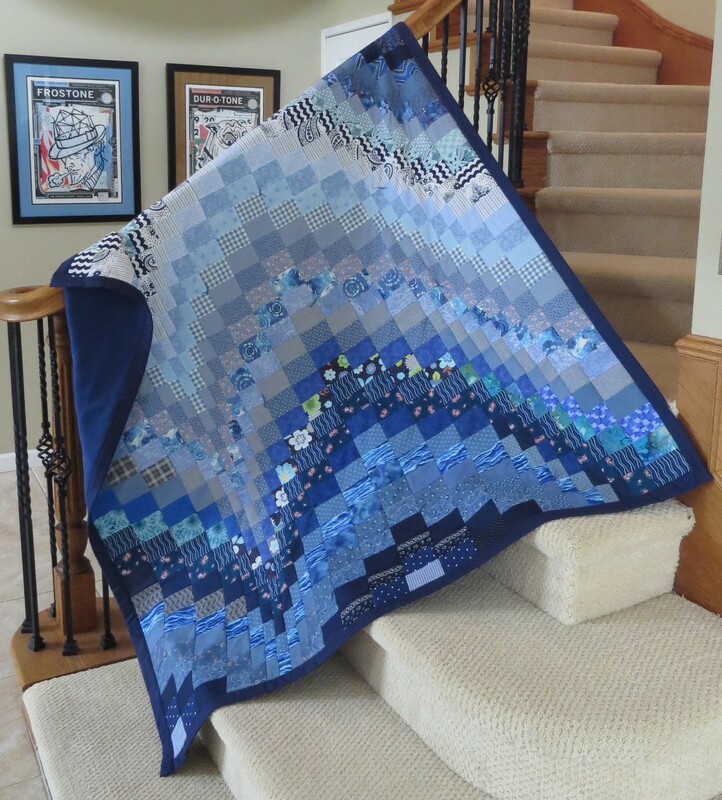 Kate received blocks from all over the world, and she then did the final layout, joining and quilting to achieve an amazingly beautiful quilt! 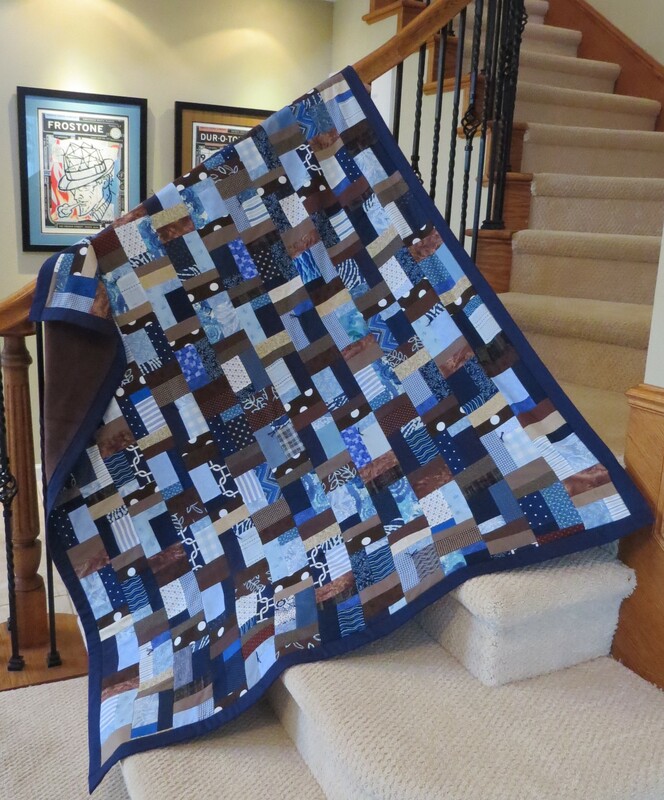 I hope you take a moment to check out the finished quilt on her blog (click here). My block is the second block in the second row. This quanket is a Prairie Flower block pattern. 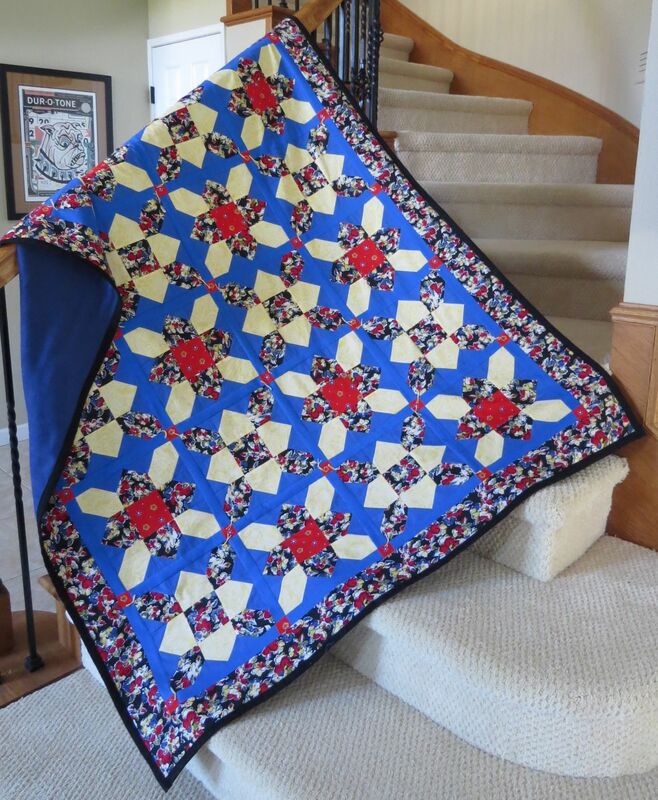 Jenny over at the Missouri Star Quilt Company has a great tutorial on YouTube if you are interested in giving this design a try. It’s always such fun to see how fabric choice and placement can drastically affect the look of a design. Jenny’s quilt has a very modern vibe to it, and you certainly get the sense that they are flowers. However, I quickly found that this pattern can create a strong X design when using the same fabric for each block, which I only noticed as I started getting my finished blocks onto my design wall. And since I was using strong colors in my colorway, it seemed to make the X’s stand out quite a bit, which I felt detracted from the “flower” aspect. Instead of going back to square one, literally, I decided to stick with the fabrics I had chosen, but to alter the fabric placement in every other block to help break the X’s. The fabric I pulled from my stash to represent a piece of the past is the floral that is in the border and flowers, which I inherited from Edith. I suspect she had planned to make a dress with it, as there were, and still are, several yards of this fabric in my stash! I then pulled in yellow, red and blue to complement the colors in the floral. This was donated to the County of Ventura, Children & Family Services, for a child in foster care in December 2018. This is my adaptation of Jacquelynne Steves Save the Bees BOM which began back in August. Since I was away on a road trip through Utah and Colorado for most of August, I felt a bit rushed to get the first block done when I got home, and chose to deviate from Jacquelynne’s original flower appliqué design for this block (my block is in lower left corner). I used an embroidered tea towel to which I added the embroidered bee. For September’s BOM, pictured in the lower right corner, I designed the flower appliqué to better match my first block, intentionally winding it on a post so that I could do a second accompanying block with a beehive sitting atop the post. 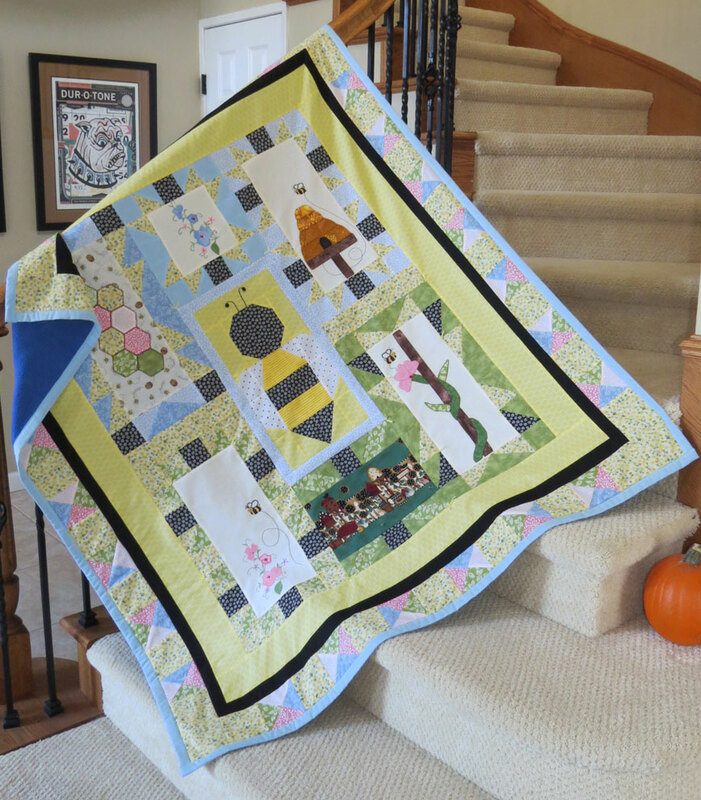 I wanted to incorporate a memory from our road trip into this quilt, and what could be more fitting than a beehive! The beehive is the state symbol of Utah, which we saw a lot on our trip since this is on all their state highway signs. The two blocks on the right side are what I made in September. October’s block is the one with the hexagons in the upper left and November’s block is the bee in the center. Since I had varied the design from the start, I had planned on making the third and fourth blocks and then choosing one or the other for the final quilt. However, once I had everything on my design wall together, I liked them all so much that I didn’t want to have to choose between these two. Instead, I opted to further deviate from the original design for this quilt to make it what it has become. I used a lot of fabrics from my stash, many that were Pieces of the Past, including two embroidered tea towels, the cute bee fabric behind the hexagons, and the fabric shown below which is a Debbie Mumm print from 1995. The stamp on the fabric says Debbie Memm – perhaps like coins, this misprint makes it more valuable? 🙂 This has been a fun project to participate in. I learned new things like how to make an HRT, as well as dusting off my appliqué skills. This is a variation on a Churn Dash quilt block that I first saw on Jacquelynne Steves Sew Quilty Friends Facebook group. 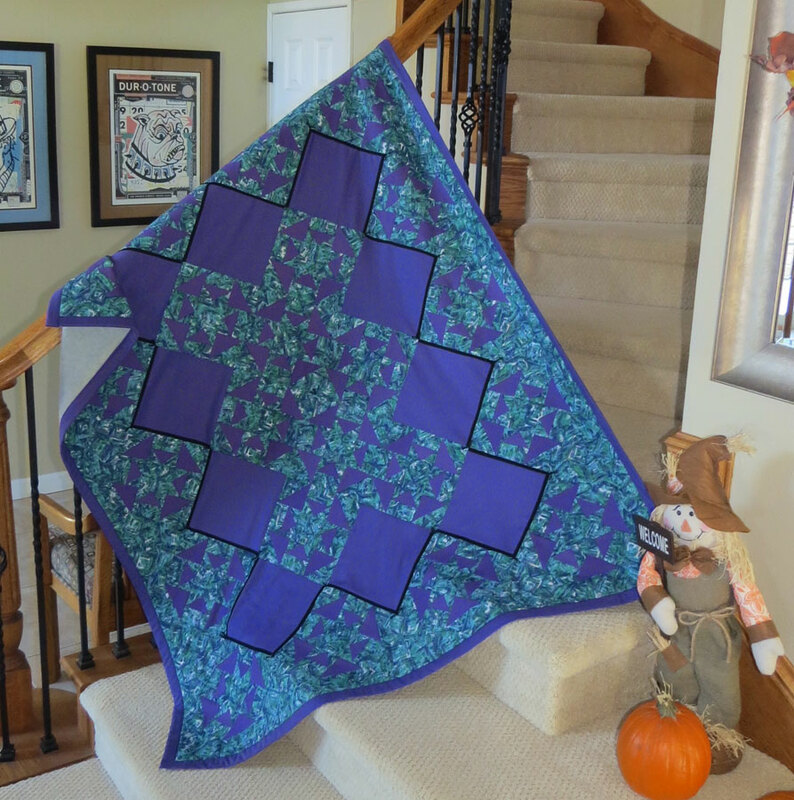 In researching to find out more about this block design, I came across this similar Churn Dash variation over at Angela Walters Midnight Quilt show on YouTube, and I also found a great resource site, BlockCrazy.com. In all that I looked at, this block seems to be a melding of the Capital T block and the Churn Dash block. For the colorway, I really wanted to keep it limited to just two colors. However, as it came together on my design wall, I decided to add the thin black lines around the purple blocks to draw the eye to the center of the quilt, and give more definition to the purple blocks. The patterned teal’ish fabric is one that has been in my stash for years (a piece of the past from Granny), and is probably circa 1970’s. Like my last quanket, the name inspiration also comes from music. I always have music playing while I am working in my studio, and while working on this quilt, Chad Lawson’s piano piece, Nocturne in A Minor came on, and wow, what a beautiful piece. I felt the name Nocturne was befitting, as the color palette of this quanket has a night-time feel to it. This was donated to the County of Ventura, Children & Family Services, for a child in foster care in October 2018. This is the first time that I have participated in a Block of the Month (BOM), and so far, it’s a lot of fun! This free BOM project is called Save the Bees and is being hosted by Jacquelynne Steves over at The Art of Home. It is running through December, and there is still time to join – just use the form on the right side of this page. 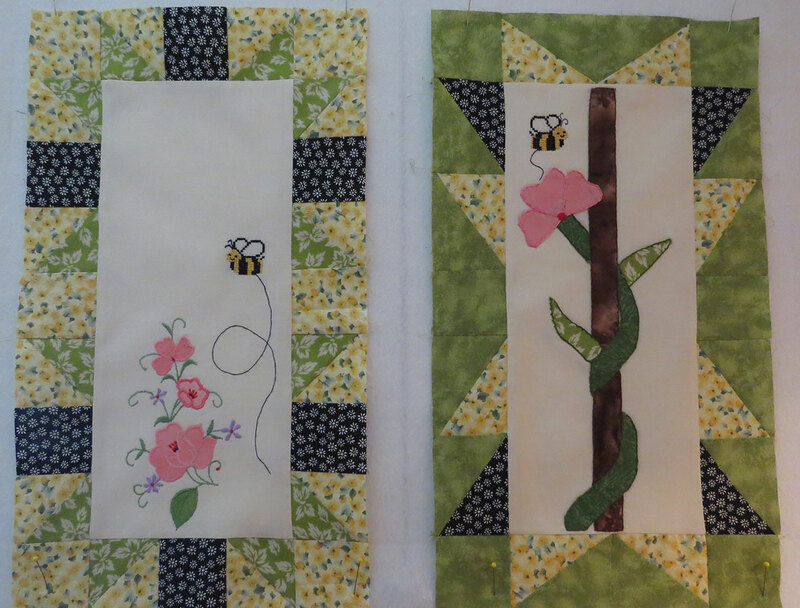 The first block in this BOM is the one pictured on the left above, and while it called for an appliquéd flower and bee for the center of the block, I chose to use an embroidered tea towel instead for a couple of reasons. First, since I had been on vacation for much of August, I only had a few days left in the month to get this done before the September BOM came out. 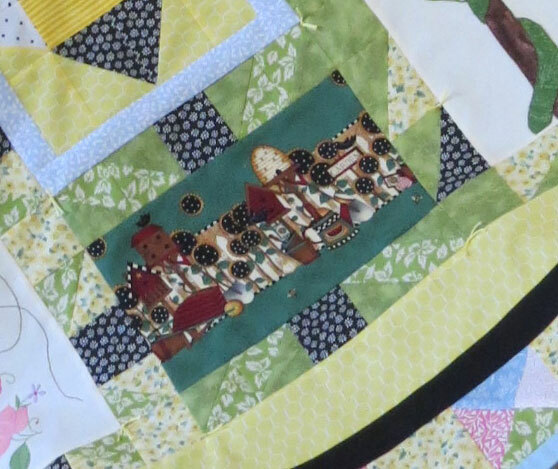 Second, I always try to incorporate a ‘piece of the past’ into my quilts, and I really liked this tea towel I had inherited from Edith for the center of this block. I then embroidered the bee to keep with the #SavetheBees theme. For September’s BOM, pictured to the right above, because I had drifted from August’s BOM flower design, I designed the flower appliqué to better match my first block. I haven’t done much appliqué since I learned the freezer paper technique about 15 years ago, so it was great to dust off this skill 🙂 I used Heat n Bond Lite to hold the pieces, and then needle turn appliqué around the edges.